Toxoplasmosis is an anthropozoonosis caused by the protozoan Toxoplasma gondii (T. gondii) which is the most important parasite that infects mammals and birds worldwide. It infects one-third of the world’s population-]. It is ranked third on the global scale of parasitic diseases in terms of importance and major risks that it is responsible for. Although it is usually asymptomatic, T. gondii can cause opportunistic infections in humans and animals, in immunocompetent individuals,. Moreover, it may be responsible for a fatal disease in fetuses and immunodeficient patients,. Indeed, when a T. gondii infection is acquired in pregnancy, the parasite can be transmitted across the placenta to the fetus, resulting congenital toxoplasmosis, which can have severe consequences. The clinical spectrum of fetuses, newborns and children congenitally infected with the parasite could range widely from complete asymptomatic form to severe neurological and ocular diseases, and even death. According to the date of maternal infection, the risk of infection is believed to increase from the beginning to the end of pregnancy, while, severity decreases progressively,. It is now well accepted that congenital toxoplasmosis has a worldwide distribution with the global annual incidence estimated to 190 000 cases. In Morocco, toxoplasmosis remains nationwide poorly documented despite the high national prevalence (50%) encrypted through serological analysis,,. Many studies have shown that the epidemiological importance of the different routes of transmission of infection diseases depends largely on population behaviour and knowledge,,,,. Knowledge is an important determinant to establish behavioural change. Good knowledge about the disease may help reduce risk of congenital toxoplasmosis, as it has been shown in Canada, in Poland and in Belgium. The objective of our epidemiological study is to assess the knowledge and behaviour risk of toxoplasmosis in pregnant women of Essaouira Province where toxoplasmosis serology is not supported by health institutions. This observational survey was conducted in different health institutions (public) of Essaouira Province (31°30’47”N 9°46’11”W). The total population of Essaouira Province is 450 527 habitants with 21% lives in urban areas. Pregnant women were included in the study according to an accidental probabilistic sampling. In addition, we collected data about toxoplasmosis diagnosis at the Province exists only in private medical analysis laboratories due to their absence in public sector. Data were entered and analyzed by the statistical packages SPSS 20 software. The semi-structured standardized interviews were used for data collection from eligible participants. The interview took approximately 30 minutes for each participant. The first section of the interview covered demographic (age), socio-economic (living area, professional activity, education level) and immune status data, while the second section covered data about knowledge and risk behaviour related to the disease. Our study was conducted in full respect of local ethical considerations, namely obtaining authorization (N°004/17) from the regional and local Moroccan Ministry of Health services. After informing women by the aim of our research, we asked for their consent and their agreement to participate in the study. All participants provided informed consent and all data were collected under anonymity. Overall 600 women have participated in the present study, their age ranged between 18 and 41 years with 96% aged between 20 and 40 years and 82.5 % of the participant were from rural area. A seroprevalence of 27.0% (162/600) was revealed among the 600 women of Essaouira Province. Indeed, of the 600 women, only 3.7% (22 women) carried out the screening test for T. gondii and 96.3% (578 women) have never benefited from an anti-toxoplasmic serological test and they were unaware of their immune status. Among the 22 (3.7%) women who carried out the anti-toxoplasmic test, we found that 72.7% (16 women) have been shown to be immunized and 27.3% (6 women) were not immunized. A total of 72.0% of immunized one are from rural areas. According to data collected from the only private laboratory of Essaouira, the seroprevalence of T. gondii was 29.20%, 24.92% and 25.99% in Essaouira for years 2015, 2016 and 2017, respectively [Table 1]. Table 1: Toxoplasmosis seroprevalence from private laboratory (2015-2017) in Essaouira Province. 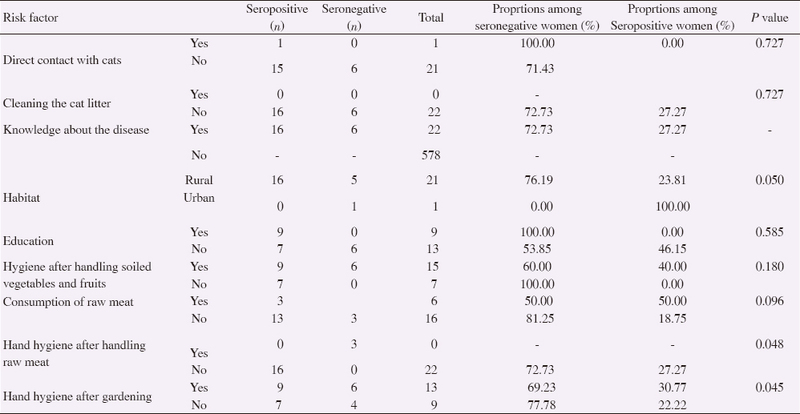 To assess the women’s behaviour related to toxoplasmosis, the association between serological status and potential risk factors [Table 2] was assessed using the Chi-square test of Pearson (Khi2). This bivariate analysis has highlighted a statistical non-significant association of T. gondii infection and the possession of a feline (P=0.727) and the consumption of raw meat (P=0.096). While, the low level of hygiene after handling with raw meat (P=0.048) and contact with the soil (P=0.045) can be considered the main causes of the disease’s transmission in the study area [Table 2]. Table 2: Bivariate analysis of the different risk factors for toxoplasmosis in the region of Essaouira. Regarding participant’s knowledge related to toxoplasmosis, only the women carried out the screening test (22/600) have confirmed knowing the disease, its mode of transmission and some complications in the fetus and in the mother. And 99% of women confirmed that they never read nor received documents or information about the toxoplasmosis. To assess the knowledge and behaviour risk of toxoplasmosis in Essaouira Province, we conducted epidemiological investigations among 600 pregnant women. And 82.5 % of the participant was from rural area, probably the rural population are more often to frequent public facilities. Data about the immune status showed a seroprevalence of 2.7%. It is a very low value compared to national and regional seroprevalences. Indeed, the seroprevalence of latent toxoplasmosis infection in pregnant women, in Morocco, is estimated to be around 51%,; while, the seroprevalence of pregnant women immunized against toxoplasmosis in Essaouira-Safi region was estimated to achieve 45 %. In other regions of Morocco, El Mansouri et al. have reported seroprevalences of 50.6%, 43.3 %, 42.6 % and 36.7 % in Rabat, Nador, Tétouan and Kénitra, respectively. In the present study, according to the private laboratory archives, the seroprevalence was about 26.7% between 2015 and 2017, while among 22 (3.7%) women who carried out the anti-toxoplasmic test, 72.7% have been shown to be immunized. Results underline the absence of exact data about the prevalence and the incidence of T. gondii in the study area. In the present study, we highlight also the access to the anti- toxoplasmia serological tests is limited and absent in public hospitals and birthing centers of the study area. All women retained for this study have carried out the test in a private laboratory. The most commonly identified sources of T. gondii infection in humans include the consumption of undercooked infected meat, tasting meat during cooking, unpasteurized milk, untreated water, contact with soil in contaminated fields, the contact with infected animals, during a blood transfusion or while traveling to areas where toxoplasmosis is important in terms of number of infections. In the present study, a statistical non-significant association between the possession of a feline (P=0.727) the consumption of raw meat (P=0.096) and the disease was shown. Results may be linked to socio-cultural factors. The possession of feline is not common in Moroccan society neither consumption of raw meat. These results are consistent with the study of Said et al. who showed that the interaction with cats and the consumption of raw meat are not associated with the disease. In contrast, the lack of knowledge about the disease and soil contact could be the main causes of toxoplasmosis infection in different regions of Morocco ,,. In the present study, only the women carried out the screening test (22/600) have confirmed a good knowledge about the disease. Studies from the United States have shown that most women of childbearing age and pregnant women had a limited knowledge of methods to prevent many infection diseases including toxoplasmosis. Indeed, the participants’ mean age was 27.5 years and 96% aged between 20 and 40 years which is reflecting a young population and corresponding to childbearing age. Knowledge of the routes of transmission to humans is essential for the prevention of infection among risk groups such as susceptible pregnant women. Our results showed that the low level of hygiene (P=0.048) and contact with the soil (P=0.045) can be considered as the main causes of the disease transmission in Essaouira province. Soil may be the main cause (6% to 17% of cases) of the transmission of oocysts to people who had contact with it for extended periods of time. It increases the risk of contracting the parasite because after contact with a soil containing cat faeces, the oocysts become infectious for 1-5 days following their sporulations. The geo-demographic status is suspected to have a direct impact on the seropositivity of the disease because soil contact is more frequent in rural area. Toxoplasmosis has been associated with women of childbearing age and residence in rural areas in Colombia and in China,. In the present study, 72.0% of immunized women were from rural areas. The absence of medical check and the scarcity of information, especially in hospitals, can be a high risk since the global knowledge of women is always basic to the disease (99% of women have never read about the toxoplasmosis). In addition, we noted 27.27% at least of seronegative pregnant women among the participants. The health education for seronegative pregnant women is the most effective measure to prevent maternal infection,. Even though T. gondii has been identified as the food-borne pathogen associated with the second largest public health’s impact in several developed countries, it remains neglected and poorly documented in Morocco given the lack of a National Program as with other parasitic diseases (Paludisme, Schistosomiasis and Leishmaniasis). Toxoplasmosisis a zoonosis with several interrelated factors (socio-cultural, demographic, and environmental factors) making the risk of contracting the disease more important. Our study highlights the underestimation of the T. gondii seroprevalence in Essaouira Province. More than 96% of women were unaware of their immune status since screening tests are only done at private laboratories under the gynecologist request and only for pregnant women. Therefore, intensive health communication is needed for acquiring knowledge about the disease and behaviour change. Mohaghegh MA, Yazdani H, Hadipour M, Namdar F, Azami M, Kalani H, et al. Seroprevalence of Toxoplasma gondii Infection among Patients Admitted to Al-Zahra Hospital, Isfahan, Iran. J Ayub Med Coll Abbottabad 2015; 27 (4):767-770. Dubey JP. Toxoplasmosis of animals and humans. 2nd ed. Boca Raton: CRC Press, Taylor and Francis Group; 2010, p.313. Tenter AM, Heckeroth AR, Weiss LM. Toxoplasma gondii from animals to humans. Int J Parasitol 2000; 30: 1217-1258. Montoya JG, Liesenfeld O. Toxoplasmosis. Lancet 2004; 363 :1965-1976. Kieffer F, Wallon M. Congenital toxoplasmosis. Handb Clin Neurol 2013; 112: 1099-1101. Peyron F, Wallon M, Kieffer F, Garweg JG. Toxoxplasmosis. In: Wilson CB, Nizet V, Maldonado YA, Remington JS, Klein JO (eds). Remington and Klein ' s infectious diseases of the fetus and newborn infant. 8th ed. Philadelphia: Elsevier Saunders; 2015. Lévesque B, Davys-Ndassebe A, Hubert B, Lavoie E, Proulx J, Libman M. Prevalence and incidence of Toxoplasma gondii infection in pregnant Nunavik (Canada) women between 1994-2003. Epidemiology 2007; 18: S32. Khairi H, Fekih M. Management of toxoplasmic seroconversion during pregnancy. Rev Tun Infectiol 2008; 2: 2, 1-4. Torgerson PR, Mastroiacovo P. The global burden of congenital toxoplasmosis: A systematic review. Bull World Health Organ 2013; 91: 501-508. Mekouar A. Contribution of the epidemiology of toxoplasmosis, serology of toxoplasmosis in Morocco. Ph.D thesis. Faculty of Medicine and Pharmacy, Bordeaux Π University, France; 1972. Laboudi M, El Mansouri B, Sebti F, Amarir F, Coppieters Y, Rhajaoui M. Risk factors for positive toxoplasmic serology in pregnant women in Morocco. Parasite 2009; 16: 71-72. Laboudi M, El Mansouri B, Rhajaoui M. The role of the parity and the age in acquisition of toxoplasmosis among pregnant women in Rabat. IJIAS 2014; 6 (3): 488-492. Pereboom MTR, Manniën J, Spelten ER, Schellevis FG, Hutton EK. Observational study to assess pregnant women’s knowledge and behaviour to prevent toxoplasmosis, listeriosis and cytomegalovirus. BMC Pregnancy Childb 2013; 13: 98. Contiero-Toninato AP, Cavalli HO, Marchioro AA, Ferreira ÉC, da Costa Lima Caniatti MC, Breganó RM, et al. Toxoplasmosis: An examination of knowledge among health professionals and pregnant women in a municipality of the State of Paraná. Rev Soc Bras Med Trop 2014; 47 (2):198-203. Rosso F, Les JT, Agudelo A, Villalobos C, Chaves JA, Tunubala GA, et al. Prevalence of infection with Toxoplasma gondii among pregnant women in Cali, Colombia, South America. Am J Trop Med Hyg 2008; 78: 504-508. Liu Q, Wei F, Gao S, Jiang L, Lian H, Yuan B, et al. Toxoplasma gondii infection in pregnant women in China. Trans R Soc Trop Med Hyg 2009; 103: 162-166. Elsafi S, AL-Mutairi WF, Al-Jubran KM, Abu Hassan MM, Al Zahrani EM. Toxoplasmosis seroprevalence in relation to knowledge and practice among pregnant women in Dhahran, Saudi Arabia. Pathog Glob Health 2015; 109: 377-382. High Planning Commission, General census of Population and Habitat. Kindom of Morocco Ministry of the Interior. Directorate General of Local Authorities. 2, 12, 2014; 15-63. [Online] Available at: https://www.hcp.ma/RGPH-2014_r230.html[Accessed on 10 June 2018]. Guessous-Idrissi N, Lahlou D, Sefiani R, Benmira A. La toxoplasmose et la rubéole chez la femme marocaine: Résultats d’une enquête sérologique. Pathol Biol 1984; 32 :761-765. Errifaiy H, Moutaj R. Evaluation des connaissances, des comportements et des statuts immunitaires des femmes enceintes par rapport à la toxoplasmose: Enquête épidémiologique dans la région Essaouira-Safi. Ph.D thesis. Faculty of Medicine and Pharmacy, Cadi Ayyad University, Marrakech; 2014. El Mansouri B, Rhajaoui M, Sebti F, Amarir F, Laboudi M, Bchitou R, et al. Séroprévalence de la toxoplasmose dans la ville de Rabat au Maroc. Bull Soc Pathol Exot 2007; 100: 113-116. Hussain MA, Stitt V, Szabo EA, Nelan B. Toxoplasma gondii in the food supply. Pathogens 2017; 6: 21. Said B, Halsby KD, O’connor CM, Francis J, Hewitt K, Verlander NQ, et al. Risk factors for acute toxoplasmosis in england and wales. Epidemiol Infect 2017; 145: 23-29. Gangneux RF, Dardé ML. Epidemiology of and diagnostic strategies for toxoplasmosis. Clin Microbiol Rev 2012; 25: 264. Palos LM, Bigot A, Aubert D, Hohweyer J, Favennec L, Villena I, et al. Protozoa interaction with aquatic invertebrate: interest for watercourses biomonitoring. Environ Sci Pollut Res Int 2013; 20: 778-789. Foulon W, Naessens A, Derde MP. Evaluation of the possibilities for preventing congenital toxoplasmosis. Am J Perinatol 1994; 11: 57-62.